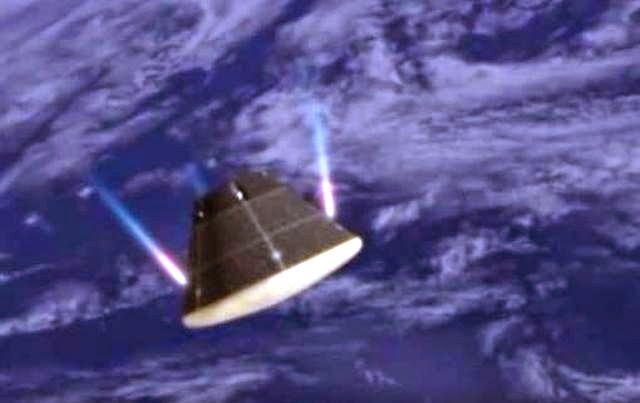 NASA exposes Illuminati ties with perfectly timed (911) apogee during the "Orion Test Flight"
During the test flight of the Orion spacecraft on December 5, several times the flight officer says 911 and 191 referring to the peak altitude/time of the spacecraft, but is it possible that 911 and 191 also refer to hidden Illuminati signs? Posters comments: Orion was originally Osiris. Osiris is the God trapped in the space time box, center of the two pillars, or tree of life. Of course that's what the Twin towers were modeled after. 9= God 11=Space time duality. God is hidden in the tree of life 191 = Osiris in the box, 911= out of the box. There are rumors that the “Mars Mission” is a cover-up and the real mission is to fly to asteroid Apophis with only one goal to destroy or change the path of the asteroid to avoid a possible collision with earth. Project: Orion manned deep spacecraft. January 2004: President Bush announced the CEV (Crew Exploration Vehicle) project. Asteroid Apophis discovered on May 2004. Apophis will pass the Earth just 30,000km above Earth’s surface on April 13, 2029 (on Friday 13th) - less than one-tenth the distance of the moon and closer even than the communication satellites that encircle the Earth at 36,000km. Though NASA significantly improved the orbital calculation and stated the chances of the 2029 impact dropped to essentially zero, Apophis belongs to a group known as the Aten family. These do not belong to the asteroid belt and spend most of their time inside the orbit of the Earth, placing them between our planet and the sun. That makes them particularly dangerous. Furthermore, Russia has announced that they have tentative plans to land a tracking beacon on Apophis sometime after 2020, so that its orbit can be much more precisely followed from Earth is an indication that this asteroid is still a potential hazard. What if asteroid Apophis was discovered in 2003, months before the official announcement in May 2004. It explains the announcement of President Bush in January 2004 to start up the CEV project and with the arrival of the asteroid in 2029 they have 25 years to prepare the Orion spacecraft for its mission and in case the asteroid poses no risk in 2029 they can continue with their ‘back-up’ mission to Mars.